Paige is a 4th year Sociology major and Religious Studies minor at UC Santa Barbara. In her 1st year, she became involved in a nonprofit aligned with the UN sustainable development goals and became interested in the intersection of environmental issues and other forms of social justice. She is currently the President of the UCSB chapter of this organization, FeelGood, and sits on their Board of Directors. 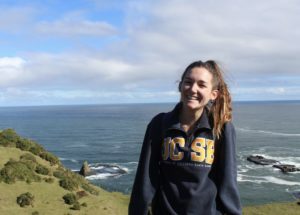 Paige brings in this lens to her work at the UCSB Women’s Center, where she has planned events around sustainability and ecofeminism, equal pay, and body positivity. Aside from her nonprofit and academic work, Paige enjoys dancing, cooking, and meeting dogs. She is a member of the Santa Barbara Student Housing Cooperative and spends time working and enjoying the community in her house.